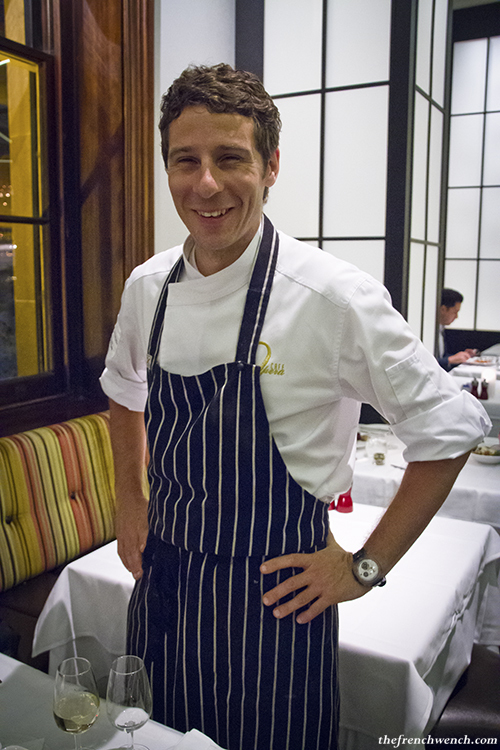 The food served at Cafe Opera reflects Julien and Executive Chef Tamas Pamer‘s endeavour to use seasonal Australian produce whenever possible. While the fine-dining A-la-Carte menu could be described as French influenced, Julien says that their renowned buffet reflects the cultural heritage of Cafe Opera’s international culinary team and that, depending to the produce available, it can offer flavours from Morocco, Asia etc. My dining companion and I were first greeted by the professional and friendly staff with a glass of Moët, which is not a bad way to start the evening. 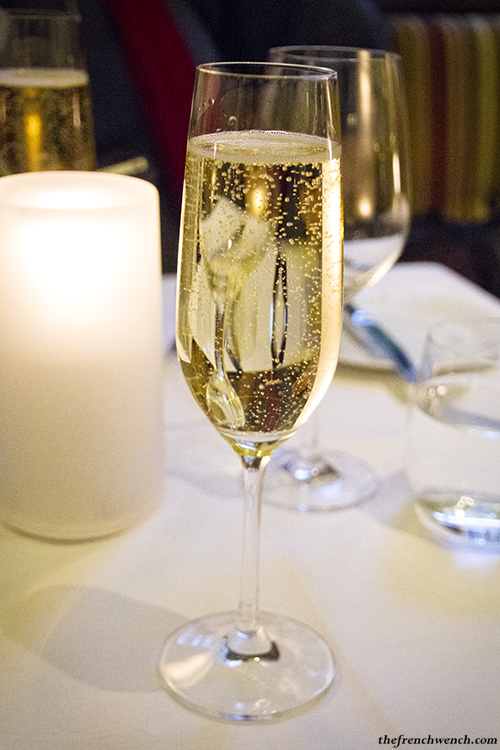 I’d forgotten how good real Champagne is! Actually, all the wines served that night were delicious. 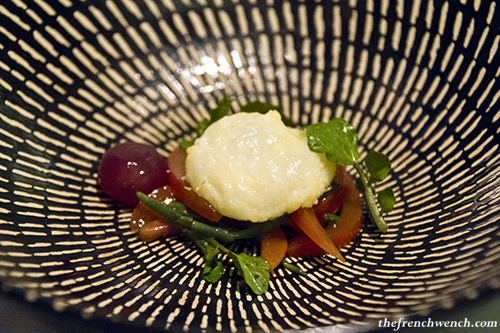 We started with an Amuse-bouche of Tomato, pickled grape, samphire and a parmesan marshmallow, which was quite fun, as once you pricked the marshmallow with your fork, it deflated like a tiny cheesy balloon. Sardines are not usually associated with fine dining and Julien explained to us that when they first put it on the menu a few years back, people didn’t really take to it. Thankfully sardine is now a bit better known in Australia, more people seem to appreciate it and Cafe Opera’s second attempt to put it on their menu proved successful. Even VF who didn’t really like sardines came out of the experience a convert! I remember as a kid eating them straight from the grill at the markets when my family and I were on holiday in Martigues in the South of France. They were smelly but really delicious. The sardines from the tins are also very good and can be aged like fine wines, with some vintages fetching higher prices than others. Great on a tartine with good quality butter, salt and pepper! This much more elaborate rendition of the humble sardine turned out to be one of the dinner’s highlights. The sardine was pickled, therefore the opposite of the tinned sardines in oil I’d been used to. 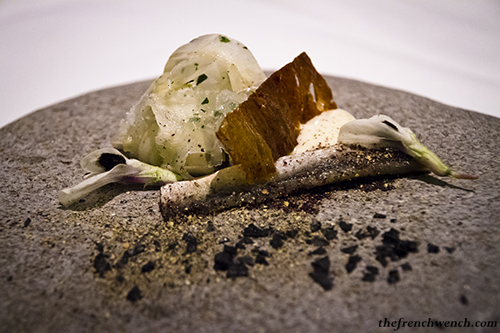 It was quite refreshing with the shaved fennel, while the aïoli and the sardine skin crisp brought a bit of tasty fat to the dish. 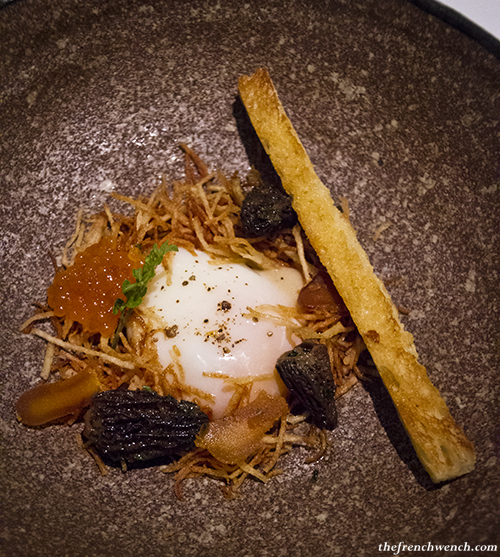 The Slow-cooked egg sounded good on paper and turns out it far exceeded our expectations. 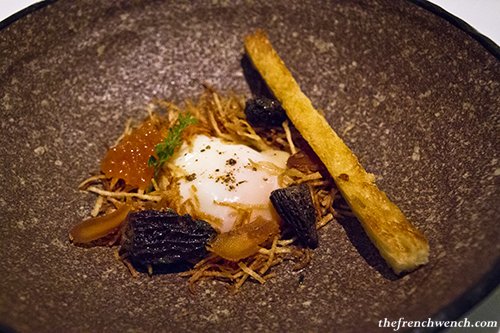 It’s one of Cafe Opera’s hit dishes and it’s easy to see why: runny egg yolk, crisp little potato sticks and a soldier to dip into the egg, delicious morels (from Victoria) and saltiness from the bottarga and salmon roe… I literally scraped the plate to make sure nothing was left of it. I was also really happy to hear you could find morels growing in Australia, even if they probably cost a fortune. They’re totally worth it though, their earthy flavour is so intense. 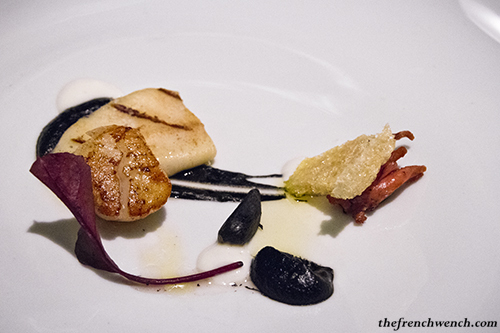 I can’t go past scallops whenever I see them, so I was pretty happy to come across this one, perfectly cooked and cleverly combined with black garlic, pork crackling and squid. After being banned for a while due to overfishing, Toothfish is back in full force on the menus all over town. It is a particularly fatty fish, as it has to endure very cold temperatures down in the deep seas where it lives, which it what makes it so popular. 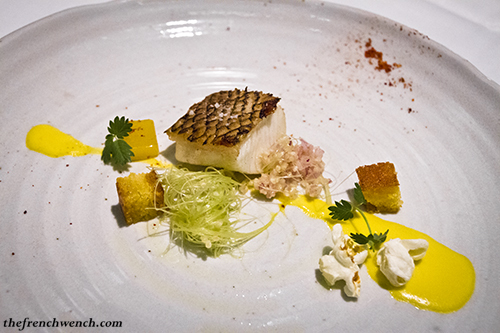 In order to echo its original name of Patagonian toothfish, the chef went with an all South-American theme, including corn served many different ways: little cubes of corn bread, young corn husk, pop corn and corn puree. The toothfish was very nice, but I think I don’t eat enough fish and don’t know enough about it to be able to say if it’s worth all the hype. 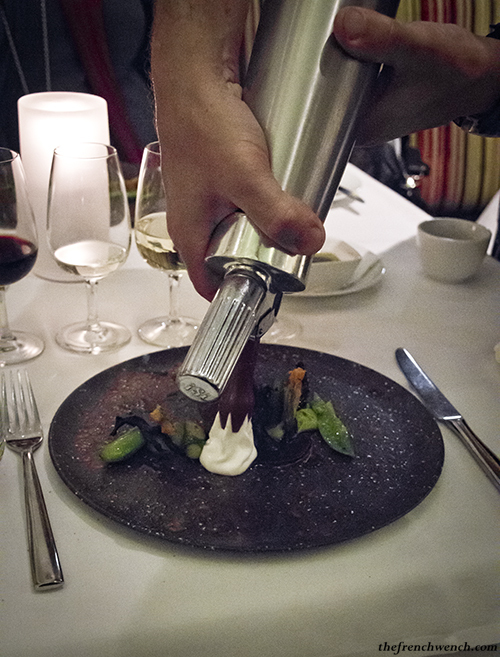 Then the main dish arrived, together with Chef Julien armed with his siphon containing goat’s milk foam, which he poured straight onto our plates. 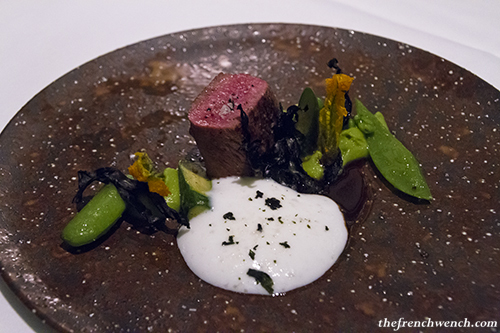 The Lamb was sourced from Australia in Flinders Island, where it was raised eating salt grass (which I learned is different from salt bush): as described on the Flinders Island Meat’s website, the “strong winds blow over thousands of kilometres of fresh sea, picking up minuscule particles of sea salt and depositing them on the already lush pastures of Flinders Island”, giving the meat a unique flavour. Well I never! The lamb was super tender, and the whole combination was just beautiful. As my dining companion better put it, it was “Spring on a plate”. 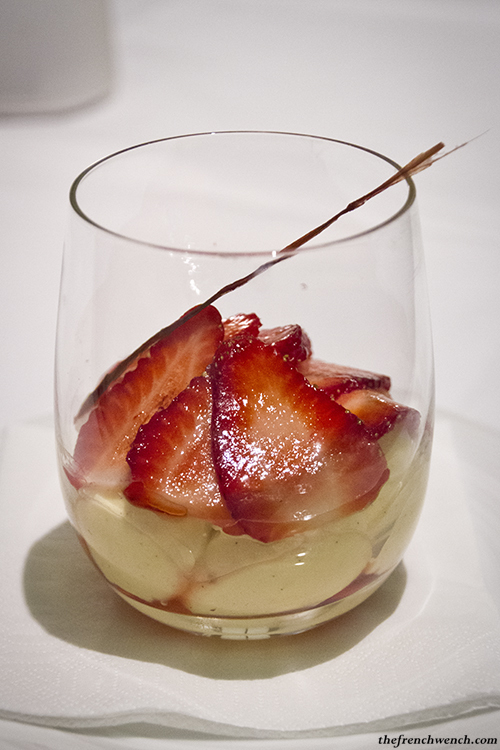 A pre-dessert of strawberry, rhubarb, vanilla, cream… a classic, but a goodie. I could easily have finished the meal on that… but there was more! 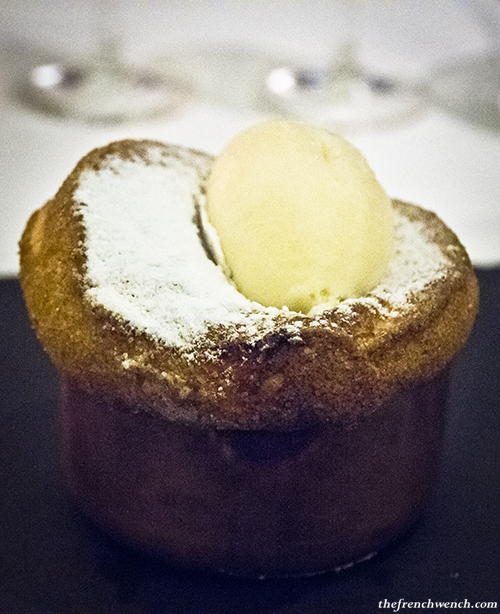 I was too slow on the camera front to capture the soufflé in its full glory, but I can just tell you it was a perfect end to this fantastic meal! 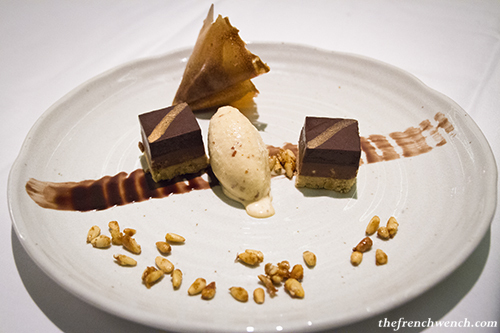 VF seemed to enjoy her dessert of Peanut Butter, Chocolate, Nougatine ice-cream and salted pine nut candy. It looked very pretty too! Thank you Julien and the Cafe Opera team for having us! The French Wench dined at Cafe Opera as a guest. This entry was posted in Restaurants and tagged French, InterContinental, Sydney. Bookmark the permalink. Wow I love morels but didn’t realise we now grow them in Victoria! Looks like a stunning meal! What a fabulous experience! So jealous!